The sixpence (6d; /ˈsɪkspəns/), sometimes known as a tanner or sixpenny bit, is a coin that was worth one-fortieth of a pound sterling, or six pence. It was first minted in the reign of Edward VI and circulated until 1980. Following decimalisation in 1971 it had a value of ​2 1⁄2 new pence. The coin was made from silver from its introduction in 1551 to 1947, and thereafter in cupronickel. Prior to Decimal Day in 1971 there were 240 pence in one pound sterling. Twelve pence made a shilling, and twenty shillings made a pound. Values less than a pound were usually written in shillings and pence, e.g. 42 old pence (​17 1⁄2p) would be three shillings and sixpence (3/6), often pronounced "three and six". Values of less than a shilling were simply written in terms of pence, e.g. eight pence would be 8d ('d' for denarius). The first sixpences were minted in 1551, during the reign of Edward VI. They came about as a result of the debasement of silver coinage in the 1540s, in particular the silver testoon, which fell in value from 12d to 6d. The debased testoon was likely useful in everyday transactions, and it was decided that new coinage should be introduced with the express denomination of six pence. The testoon decreased in value because, unlike today, the value of coins was determined by the market value of the metal they contained, and during the reign of Henry VIII the purity of silver in coinage had fallen significantly. Sixpences were minted during the reign of every British monarch after Edward VI, as well as during the Commonwealth, with a vast number of variations and alterations over the years. During the reign of George II a number of issues were designed by John Sigismund Tanner, one time Chief Engraver of the Royal Mint, and it has been suggested that this is the origin of the nickname "tanner", which was a popular name for the coin until decimalisation. An alternative explanation for the nickname is that it comes from Angloromani word tawno meaning small thing. Sixpence of Queen Elizabeth I, struck in 1593 at the Tower Mint. The Royal Mint undertook a massive recoinage programme in 1816, with large quantities of gold and silver coin being minted. Previous issues of silver coinage had been irregular, and the previous issue, minted in 1787, did little to alleviate the chronic shortage of silver coinage in general circulation. New silver coinage was to be of .925 (sterling) standard, with silver coins to be minted at 66 shillings to the pound weight. Hence, newly minted sixpences weighed 43.636 grains or 2.828 grams. The Royal Mint debased the silver coinage in 1920 from 92.5% silver to 50% silver. Sixpences of both alloys were minted that year. This debasement was done because of the rising price of silver around the world, and followed the global trend of elimination, or reduction in purity, of the silver in coinage. The minting of silver coinage of the pound sterling ceased completely in 1946 for similar reasons, exacerbated by the costs of the Second World War. New "silver" coinage was instead minted in cupronickel, an alloy of copper and nickel containing no silver at all. Beginning with Lord Wrottesley's proposals in the 1820s, there were various attempts to decimalise the pound sterling over the next century and a half. These attempts came to nothing significant until the 1960s when the need for a currency more suited to simple monetary calculations became pressing. The decision to decimalise was announced in 1966, with the pound to be divided into 100, rather than 240, pence. Decimal Day was set for 15 February 1971, and a whole range of new coins were introduced. Sixpences continued to be legal tender with a value of ​2 1⁄2 new pence until 30 June 1980. Obverse and reverse of the 1787 sixpence, depicting George III. Sixpences issued during the reign of Edward VI feature a three-quarter portrait[clarification needed] of the king on the obverse, with a Tudor rose to the left, and the denomination VI to the right. Surrounding the portrait is the inscription EDWARD VI D G AGL FRA Z HIB REX, or similar, meaning "Edward VI, by the Grace of God, King of England, France and Ireland". All sixpences minted under subsequent kings and queens bear a similar inscription on the obverse identifying the monarch (or Lord Protector during the Commonwealth), with the portrait usually flipping left-facing to right-facing or vice versa between monarchs. The reverse features the escutcheon of the Royal Arms of England, surrounded by the inscription POSVI DEVM ADIVTORE MEVM, or a variant, meaning "I have made God my helper". Starting with Elizabeth, the coins have the year of minting stamped on the reverse. Unusually, the sixpences minted in 1561 and 1562 were milled, i.e. produced by machine rather than by hand, with the press of the Frenchman Eloy Mestrelle, who had been granted authority to mint coins by the queen. Although of higher quality than hammered coins, Mestrelle's sixpences were more expensive to produce, and machine-struck coinage ceased to be minted in 1572. The coins remained in circulation for over a hundred years, but it took until the reign of Charles II for milled coins of the pound sterling to be minted again. Sixpences minted after the Tudor period no longer bear the Tudor rose on the obverse. Early sixpences of James I feature the alternative reverse inscription EXVRGAT DEVS DISSIPENTVR INIMICI, meaning "Let God arise and His enemies be scattered", becoming QVAE DEVS CONIVNXIT NEMO SEPARET, meaning "What God hath put together let no man put asunder" after 1604. Charles I sixpences follow the usual design, except that coins minted after 1630 do not bear a date, and the reverse inscription reads CHRISTO AVSPICE REGNO, meaning "I reign under the auspices of Christ". During the beginning of Oliver Cromwell's Protectorship there was no portrait minted on the obverse - instead there is a wreathed shield featuring St George's Cross, surrounded by the inscription THE COMMONWEALTH OF ENGLAND. The reverse features the combined arms of England and Ireland, surrounded by the inscription GOD WITH VS. In 1656 the minting of milled coinage resumed, this time with the press of the Frenchman Peter Blondeau. The obverse of Cromwell's milled coinage features a portrait in the manner of a Roman emperor, surrounded by an inscription similar to those on the coins of earlier monarchs. With the exception of a handful of early examples, Charles II sixpences continued to be machine-struck, and continued the usual practice of having a portrait of the monarch on the obverse. The reverse features a new design consisting of four shields arranged in a cross, with the inscription detailing the style of the monarch split across both sides of the coin. With minor changes, such as the device at the centre of the shields, and the designs between the shields, this basic design continued to be minted until the reign of George III. Those coins minted after the great recoinage of 1816 bear the royal coat of arms on the reverse, surrounded by the Garter, which bears the words HONI SOIT QUY MAL Y PENSE, Middle French for "Evil be to him who evil thinks". George IV sixpences are similar to those of his predecessor, but on some issues the Garter surrounding the shield is replaced by floral emblems representing England, Scotland and Ireland, with the inscription ANNO DATE (e.g. ANNO 1821) below. 1816 sixpence, showing the post-recoinage design. William IV sixpences have a simpler reverse, composed of the words SIX PENCE in the middle, with a crown above, the date below, and a wreath surrounding. With the exception of a withdrawn 1887 issue, Victoria and Edward VII sixpences share this reverse. The reverse of the 1887 issue is broadly the same as the post-1816 George III coins. This reverse is shared with the half-sovereign, and since the two are of a similar size, a problem arose with people passing off sixpences as half-sovereigns. The government agreed to remove the coin from circulation in November 1887 and change the reverse. The reverse of George V sixpences minted prior to 1926 feature an alternative reverse design composed of a crown surmounted by a lion, with those minted after 1926 featuring a design of six oak sprigs divided by six acorns. Only a handful of Edward VIII sixpences were ever minted, and none of these entered circulation. These feature a reverse that is different again, composed of six interlinked rings, with the inscription SIXPENCE below and part of the monarch's style inscribed above. Unusually, the profile of Edward VIII on coins faces the same way as that of his predecessor. George VI sixpences feature two different reverses, both featuring a crowned Royal Cypher. Those minted prior to 1949 feature a more angular font than those minted later. These later coins do not bear the abbreviation IND IMP, since the king was no longer Emperor of India. 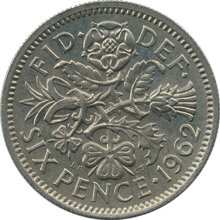 The final change in the design of the sixpence came in 1953 when a new reverse was designed for the sixpences of Elizabeth II. These coins feature a floral design by Edgar Fuller and Cecil Thomas on the reverse, consisting of a rose, thistle, shamrock and leek, representing the four Home Nations. In 2016 the Royal Mint began minting legal tender decimal sixpence coins in silver. The new reverse was designed by John Bergdahl. Obverse and reverse of the 1928 sixpence, depicting George V.
As the supply of silver threepence coins slowly disappeared, Royal Mint sixpences replaced them as the coins traditionally put into Christmas puddings. In Britain, there is a well-known tradition of the bride wearing "Something old, something new, something borrowed, something blue, and a silver sixpence in her shoe". A silver sixpence in the bride's shoe is a traditional good luck wedding gesture, and customarily it is the father of the bride who places the sixpence as a token of him wishing her prosperity, love and happiness in her marriage. They are also used as a good luck charm by Royal Air Force aircrew who have them sewn behind their wings or brevets, a custom dating back to the Second World War. In A Midsummer Night's Dream (Act 4, Scene 2), we learn that by his absence (ensorcelled in Titania's bower) Bottom the Weaver will forgo sixpence a day for life from the Duke. In Elizabethan times, six pence was roughly a day's wage for rustic labour in the provinces. With it, one might buy two dinners, six performances of Hamlet among the groundlings at the Globe Theatre, or an unbound copy of the play itself. In David Copperfield, Charles Dickens describes how its protagonist dealt with a street carman about taking his travel box to a coach office in London: "I told him mine, which was down that street there, and which I wanted him to take to the Dover coach office for sixpence", then he replying: "Done with you for a tanner!" The sixpence also features in other works of popular culture and literature. It appears in the title of the British writer Somerset Maughan's 1919 novel, The Moon and Sixpence, and appears in both the title and as a plot device in Michael Paraskos's novel In Search of Sixpence. Half a Sixpence is the title of the 1963 West End stage musical, and the subsequent 1967 musical film version, of H.G. Wells' novel Kipps. And twopence to send home to my wife. The song dates from at least 1810. An elaborated version was published in 1941, words and music by Elton Box & Desmond Cox. : the singer tells the tale of spending twopence (per verse) until he has "no-pence to send home to my wife – poor wife." Some guitarists prefer the rigidity of a coin to the flexibility of a more traditional plastic plectrum. Most notably Brian May of Queen and Ian Bairnson of The Alan Parsons Project. May at some time even had sixpence-sized coins featuring his own head struck by the Royal Mint, which he used, gave away, and sold as his signature plectrum. Sixpence None the Richer (also known as Sixpence) is an American rock/pop band whose name was inspired by a passage from the book Mere Christianity by C. S. Lewis. Penguin Books initially sold books in the 1930s through Woolworths and other high street stores for sixpence. ^ a b "Sixpence". Royal Mint Museum. Retrieved 3 October 2014. ^ a b c "The Story of the Sixpence". Chard. Retrieved 4 October 2014. ^ Seaby Coin & Medal Bulletin. B.A. Seaby Ltd. 1952. p. 382. ^ Manville, H. E.; Gaspar, P. P. (2004). "The 1787 Shilling - A Transtition in Minting Technique" (PDF). British Numismatic Journal. 74: 84–103. ^ Clancy, Kevin (1990). The recoinage and exchange of 1816-1817 (Ph.D.). University of Leeds. ^ David Groom (10 July 2010). The Identification of British 20th Century Silver Coin Varieties. Lulu.com. p. 44. ISBN 978-1-4457-5301-0. ^ The Numismatist. American Numismatic Association. 1972. ^ Christopher Edgar Challis (1992). A New History of the Royal Mint. Cambridge University Press. p. 583. ISBN 978-0-521-24026-0. ^ The Bankers' Magazine. Waterlow. 1855. p. 139. ^ Zupko, Ronald Edward (1990). Revolution in Measurement - Western European Weights and Measures SInce the Age of Science. Memoirs of the American Philosophical Society. 186. pp. 242–245. ISBN 0-87169-186-8. ^ "The Story of Decimalisation". Royal Mint. Retrieved 6 October 2014. ^ Christopher Edgar Challis (1992). A New History of the Royal Mint. Cambridge University Press. p. 659. ISBN 978-0-521-24026-0. ^ "Edward VI (1547–1553) - Silver Sixpence". AMR Coins. Retrieved 7 October 2014. ^ Borden, D. G.; Brown, I. D. (1983). "The Milled Coinage of Elizabeth I" (PDF). British Numismatic Journal. 53: 108–132. ^ "Eloy Mestrelle - Moneyer". Museum Victoria. Retrieved 8 October 2014. ^ a b Moriesson, Lieut.-Colonel H. W. (1907). "The Silver Coins of James I" (PDF). British Numismatic Journal. 4: 165–180. ^ Borden, D. G.; Francis, Grant R. (1919). "Silver coins of the Tower Mint of Charles I Chapter IV" (PDF). British Numismatic Journal. 15: 79–116. ^ "Cromwell Coins - Commonwealth of England". Cromwell Coins. Retrieved 12 November 2014. ^ "Sixpence - 1551 - 1800". 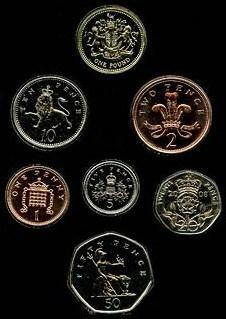 Coins of the UK. Retrieved 12 November 2014. ^ Moriesson, Lieut.-Colonel H. W. (1918). "The centenary of our modern coinage instituted in February 1817, and the issues which preceded it in George III's reign" (PDF). British Numismatic Journal. 14: 121–150. ^ a b c d "Sixpence". Coins of the UK. Retrieved 13 November 2014. ^ Daphna Erdinast-Vulcan; Allan Simmons; John Henry Stape (1 January 2004). Joseph Conrad: The Short Fiction. Rodopi. p. 18. ISBN 90-420-0960-8. ^ "Edward VIII Sixpence". Royal Mint Museum. Retrieved 13 November 2014. ^ "BY THE QUEEN A PROCLAMATION DETERMINING THE SPECIFICATIONS AND DESIGN FOR A NEW SIXPENCE COIN IN SILVER ELIZABETH R." Thegazette.co.uk. Retrieved 19 May 2018. ^ "Our Coins - The Royal Mint". Royalmint.com. Retrieved 19 May 2018. ^ Dickens, Charles (2000). "XII". David Copperfield. Ware, Hertfordshire, UK: Wordsworth Editions. p. 155. ISBN 978-1-85326-024-7. ^ This is based on story 57 of the Gesta Romanorum, in which a carpenter explains that he needs eight pence every day: two to repay (to his father), two to lend (to his son), two to throw away (on his wife) and two to spend (on himself). ^ "Those Happy-Go-Lucky Poor Folks: "I've Got Sixpence"". 7 September 2015. Retrieved 19 May 2018. ^ "Gammer Gurton's Garland: Or, the Nursery Parnassus; a Choice Collection of Pretty Songs and Verses, for the Amusement of All Little Good Children who Can Neither Read Nor Run". R. Triphook. 19 May 2018. Retrieved 19 May 2018 – via Google Books. ^ Box, Elton; Cox, Desmond; Hall (19 May 2018). "I've got sixpence (as I go rolling home)". Chappell & Co. Retrieved 19 May 2018 – via National Library of Australia (new catalog). ^ Joicey, Nicholas (1993), "A Paperback Guide to Progress: Penguin Books 1935-c.1951", Twentieth Century British History, Vol. 4, No. 1, pp. 25–56; and Ross McKibbin Classes and Cultures: England 1918–1951, Oxford, 1998, ISBN 0-19-820672-0. The threepence or 3d coin was a subdivision of the pre-decimal Irish pound, worth ​1⁄80 of a pound or ​1⁄4 of a shilling. Leath reul literally means "half reul", the reul being a sixpence coin worth about the same as the Spanish real. As with all other Irish coins, it resembled its British counterpart, as the Irish pound was pegged to the British pound until 1979.